How should your company handle data safety and version control? I’ve been writing software professionally since 1999. The first few years, I didn’t work at a company that used version control. Colin Steele mentioned Subversion to me in 2005. I used it till 2011. Since 2011, every company I’ve worked at has used Git. Most of the non-technical people I worked with thought that Subversion was fun. Most were working on Windows machines, and they would use TortoiseSVN as their Subversion client. TortoiseSVN has bright colors and buttons, a fun interface that gave it some of the advantages later enjoyed by apps like Slack. While we used Subversion, everyone on the team was able to check stuff into version control. Mangers, artists, data analysts, the QA team, everyone used Subversion. They treated it as an infinite undo, which thrilled them. They also found it useful for tracking down when a bug was introduced into the code. I recall the graphic designer felt empowered when she realized an image had overwritten another image with the same name, and she was able to reach into Subversion and get the old image. She felt empowered, because she was able to fix problems on her own. Subversion has some problems, but a lot can be forgiven in software that is so easy to use that everyone on staff enjoys using it. I am frustrated that so many leaders fail to see the importance of this. 11. developers push their changes to “origin” but forget to push to “upstream” or vice versa. Graphic designers, writers, HTML/CSS frontenders, managers, data analysts and QA staff can’t use Git, even though they all used Subversion. 4. the “blame” command is easy to use, so it is easy to figure out who made a mistake. This can be useful for educational purposes, or if you need to justify firing someone. 5. the “revert” command is simple and straightforward and does exactly what you expect it to. When non-technical staff make a mistake, they can easily revert their own mistake. 6. Graphic designers, writers, HTML/CSS frontenders, managers, data analysts and QA staff can use it. I’ve worked with many who thought Subversion was fun. I agree, Git is amazing and very powerful. What I’m suggesting is that we should recognize that it has a very high cost. It might empower complex workflows for sophisticated teams of experienced computer programmers, but it exiles the rest of the staff, and this has significant productivity costs. And Git is intimidating, not just to non-technical staff, but also to inexperienced programmers. 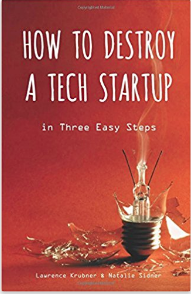 In How To Destroy A Tech Startup In Three Easy Steps I talk about Sital, and his unwillingness to commit things to Git. He was learning a great deal about many other technologies, and he didn’t have any spare energy to learn about Git. He went a month without making a commit, and then he only did so because I insisted. After I put a lot of pressure on him, he got to the point where he would make one commit a day, at night, when he was stopping for the day. He would commit to the master branch, because he was confused how to handle different branches. When there was a merge conflict, I would resolve it for him. We worked together for 6 months, and in that time he learned a great deal about a lot of important topics, but he never really learned how to use Git, because it was a low priority, for both him and our CEO. Git is very powerful? I’m willing to go along with that line of thought so long as we all understand that using a tool that is more powerful than needed can lead to problems. Git was created by Linus Torvalds to help him manage the development of Linux. It is designed for a situation where thousands of volunteers are committing work, which will be reviewed by Torvalds’s lieutenants, who will decide if Torvalds should see the code. Much of the code is rejected. In such a situation, it makes sense that developers should work in their own repo, rather than being given access to the repo controlled by Torvalds. Git does not enforce a canonical repo, rather, you can easily fork a repo and your new repo might become canon for whoever likes your fork more than they like the repo that you forked from. I have never worked at a company that had the same needs as Torvalds. Never. I’ve never worked at a company that sponsored non-canon development. Every company I’ve worked at has a canonical repo for each app that is under development (or multiple apps in one canonical repo). And yet, I have worked at companies that, for some odd reason, went ahead and implemented very complex Git strategies. For instance, when I was at Timeout.com they insisted that every developer create their own repo for each app, and do code review on their own repos, and then after code review push their branch to the canonical repo and open a pull request. While this was all possible, and we all followed the rules, there was no gain. It was a lot of rituals and complexity without any benefit. Occasionally we would each make some minor mistake, such as pushing to “origin” but forgetting to push to “upstream”, and then telling the QA team that they should test our new branch, and the QA team replying with “We can’t find your new branch, are you sure it exists?” because of course they are looking at “upstream” and we only pushed to “origin”. Minor, but annoying, and what were we gaining for this extra trouble? The funny thing is, the company still had repos that were clearly canonical. We weren’t building Open Source software. We weren’t Torvalds. We were a company that had to deploy proprietary software to servers that we controlled. We gained nothing from the distributed nature of Git. Nearly every place I’ve worked would have been better off with Subversion, as it would have allowed smoother workflows integrating the work of the whole team, in particular the non-technical staff (data analysts, graphic designers, QA team, HTML/CSS frontenders). When I say all this, I am often misunderstood. No. Just no. Please stop spreading FUD like it’s candy. Git only deletes commits after a GC, which won’t erase commits from reflog and will keep unreferenced commits for at least a month before deleting them. And rebasing generates new commits, leaving the old ones exactly how they were. If somebody lost a commit after a rebase, and nobody nearby could help them recover it, they should consider spending a few hours learning about git. I’ve been using git for 4 years both at work (with a team of 40+ people) and at home, without ever having any of the problems listed here (except 3 which has nothing to do with git). It takes a few hours, maybe a few days to understand how git works and how to use it. Instead of blaming the tools, you (and your team) should probably learn how to use them. It is frustrating that you continue to take your advanced skills for granted. It is frustrating that you can not see what should be an obvious fact: that your skills are above average and therefore it is a mathematical fact that most people have less skill than you, and their lack of skill is a real world business situation that needs to be dealt with realistically. And more so, for the rest of your career your skills will continue to develop, so the gap between you and the average will continue to grow, and therefore the damage that you can do will continue to grow, if you fail to recognize that you are above average. I can assure that I’ve seen data lost forever because of “git rebase”. It doesn’t matter that someone with your skills could have saved the situation. You were not there, therefore your skills don’t matter! It is very important that you see this, or you will never be able to give accurate advice to business leaders. But sometimes the business leadership will disagree with you. They may have terrible reasons, but if you can not get them to change their minds, then you need to deal with the consequences of their bad decisions. At which point it makes sense to advocate for a technology that only requires a skill level of x. That is, you have above average IQ and skill, therefore you perceive things to be easy, which are in fact not easy for the average. The essence of my argument then, the best version control system, for your company, is the one that is easiest to use by the people in your company. Your workers might be very intelligent and have important skills, but learning about version control might not be among their skills, yet you will still want to give them access to your version control system. So look for the easiest version control system that works for your whole team.